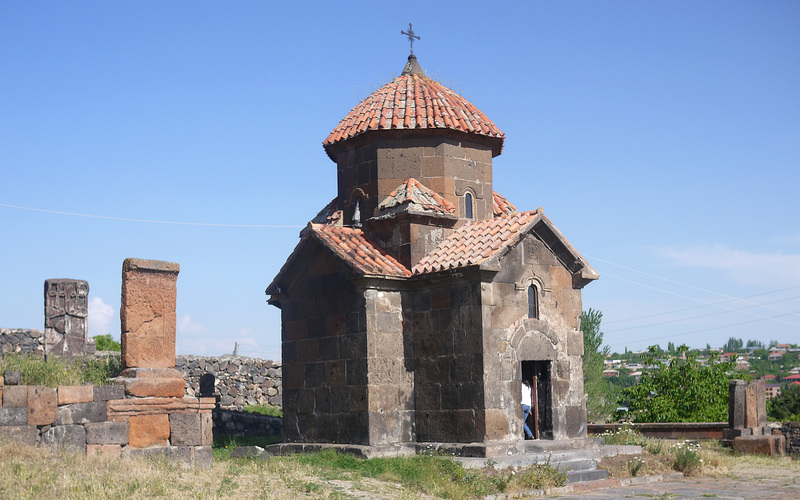 This is Kramravor, said to be the earliest surviving church in Armenia, The red roof tiles are said to be the original. Armenia adopted Christianity early. This was due to the great evangelist St Gregory the Illuminator, sometimes called Gregory the Enlightener (AD257-337). Armenia at the time was a buffer state between Rome and the Parthians, under the rule of the Arsacid Dynasty who were originally Parthians, but who skilfully and constantly changed sides from being pro-Persian or pro-Roman, and thus managed to keep Armenia as a sort of buffer state from AD54 – 428. In 287, Tiridates III was put on the throne by the Romans. His predecessor, who was pro-Persian, had been murdered by St Gregory’s father, but the young Gregory managed to escape to Cappadocia where he became a Christian, and then decided to expiate his father’s crimes by going to Armenia and converting it to Christianity. In this however he was not at first successful because a) Tiridates had been put on the throne by Diocletian who persecuted the Christians, and b) Gregory’s father had murdered his father. He therefore threw St Gregory into an underground pit where he remained for thirteen years. Eventually however God took a hand and the King was struck with an illness which made him crawl on the ground like a beast. However the King’s sister decided that the best way to cure this was to release St Gregory, and as a result, the King recovered and was converted to Christianity with all his court, and in 301 declared Armenia to be a Christian country – a good ten years before Constantine the Great did the same at Rome. St Gregory then founded the first cathedral of Armenia at Ejmiatsin, at the place where Christ had struck the earth with a hammer. Archaeologists since have been spoilsports and pointed out that underlying the cathedral there is in fact a Roman temple. 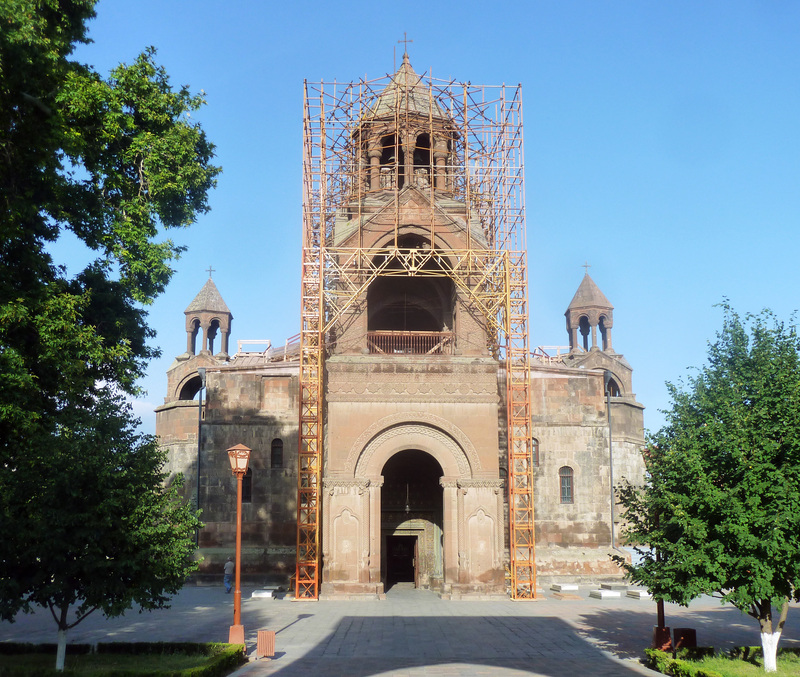 The cathedral was rebuilt in the 480s on a cruciform plan which has formed the model for Armenian churches ever since. The church was badly damaged in the 17th century wars between Persia and Turkey, and was extensively renovated. Today it is at the centre of a very large religious complex where numerous grave stones brought from different parts of Armenia have been erected, and there is an elaborate modern gateway, and also a seminary, closed during the Soviet period but reopened in 1997. After the original conversion, Christianity flourished, and in the early 5th century the Bible was translated into Armenian. To do this a special alphabet had to be invented by St Mesrob Mashtots. Unfortunately however (and don’t tell the Armenians this, because they are very proud of their alphabet) Mashtots made a big mistake in basing his alphabet on the Persian script rather than the Greek or Latin alphabet. Consequently although it is a proper alphabet with thirty four letters, it is nevertheless completely incomprehensible to western eyes. It is nevertheless a powerful unifying symbol for Armenia. The translation of the Bible took some time – Mashtots was a better inventor of alphabets than he was a translator – and it was not until 434 that the Bible was finally produced, leading to the first great flourishing of Armenian literature, with a first Armenian history being written by Agathangelos, who wrote a history of St Gregory. However the Armenians were unable to attend the Council of Chalcedon in AD 451 when the Monophysite heresy was refuted and everyone agreed that God does not have one nature but two, being both God and Man. Not having been at the Council, the Armenians remained Monophysites and held their own council at Dvin in 506 , when they reaffirmed their belief that God has but one nature, which is why today the Armenian church differs from the rest of us, because we all believe that God has two natures. The Armenian cruciform-style church originally established at Ejmiatsin swept all before it, and was soon established as the proper style for an Armenian church. There was one big exception, which was the other major cathedral, which was also established nearby at Zvartnots. (Recently the Yerevan international airport has also been established nearby, so that today Zvartnots tends to mean airport. To the archaeologist however, it means a major cathedral, now a World Heritage site). It was built by the Catholicos Nerses between 643 and 652, but to an entirely alien circular style. At the centre there was a tetraconch (equals four seashells) central structure surrounded by circular aisles. It was apparently very tall and may even have been three stories high. However it did not last long, for in the 10th century it collapsed, possibly in the great earthquake of 930. However from 1901 -1907 it was excavated together with the adjacent palace and winery (the archbishops who lived there, lived well). An Urartian inscription of Rufa II was also discovered during the excavations indicating that it was almost certainly built over an earlier Urartian structure. 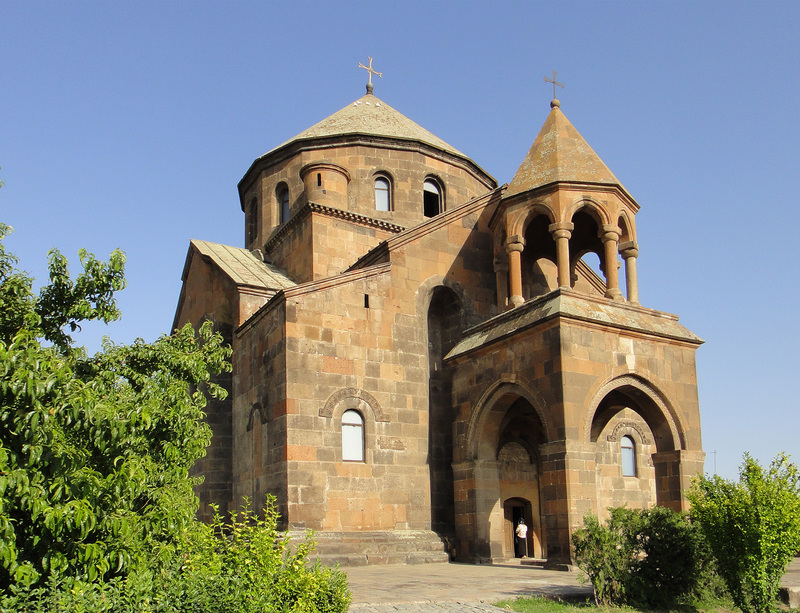 However mainstream Armenian churches continued in the cruciform format and probably the best known example of this is the Church of St Hripsime, today one of the most visited churches on the tourist route. Hripsime was a beautiful virgin and the Roman Emperor Diocletian lusted after her. She therefore escaped with her fellow virgins to Armenia where she was eventually captured on the Emperor’s instructions, and tortured and suffered a martyr’s death. The church erected over her tomb is one of the earliest, as well as one of the most solid of all Armenian churches, having survived several earthquakes more-or-less intact. Hripsime was buried in the crypt, and it appears that there was a circular ambulatory around the crypt, but today only one side of this survives. At the back there are the foundations presumably of the monastic buildings, and the whole church has on one side a defensive wall, implying that at one time it was once the centre of a large monastery. It was repaired in the 17th century and today has a souvenir shop on the approach road. In 690 Armenia was captured by the Arabs and for two centuries or more church building ceased. There was however a revival in the 12th century, and a further revival in the 17th century when many of the churches were repaired and rebuilt. In the Soviet era, the Armenian church managed to survive comparatively well, but following the end of the Soviet Union in 1990 there has been a major revival and the churches in Armenia are now very flourishing.